What starts out as a typical family vacation to Grandma and Grandpa's house quickly erupts into supernatural mystery and peril when three siblings accidentally break an old, mystical jar hidden deep in the woods. 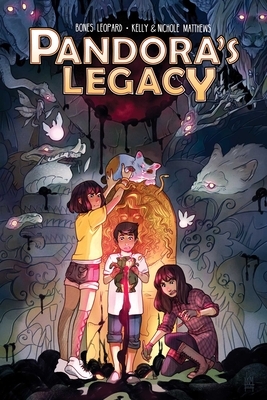 As magical monsters pour out of the fractured relic and run amok, Charlie, Janet, and Trevor must find a way to capture all of the creatures in order to save their family—and potentially the entire world—before it's too late. Writer Kara Leopard ([Super]Natural Attraction) and illustrators Kelly and Nichole Matthews (Jim Henson's Power of the Dark Crystal) weave an otherworldly tale about finding help in the unlikeliest of places, learning the truth about your family history, and most importantly of all, talking cats.